Sofitel Bangkok Sukhumvit - Luxury hotel - Book Now & Pay Later! Discover the BEST PRICE GUARANTEED at Sofitel Bangkok Sukhumvit! Since your dates are a while away, choose free cancellation to stay flexible. A change of plans is no problem when you have free cancellation! Flexible Rate Starting from THB 4,550++! Discover luxurious rooms that reflect Bangkok’s vibrant personality. Each stylish Luxury room blends local décor with international modernity. Each stay is a sumptuous experience and each room is unique, with views of the glimmering city beyond panoramic windows. Voila! Is the perfect place to start your day, offering the best breakfast Bangkok hotel establishments can offer, dishing up both Asian favourites and Continental fare accompanied by exciting live cooking stations. So treat yourself to a rejuvenated morning at the best hotel breakfast buffet Bangkok is home to! Sofitel Bangkok Sukhumvit is recognised as one of the best luxury 5 star hotels Bangkok is home to. As a premier member of the esteemed AccorHotels family, the Sofitel brand consists of luxury properties that range from urban city centre establishments, to incredible seaside resorts and chalet style properties nestled above mountains. 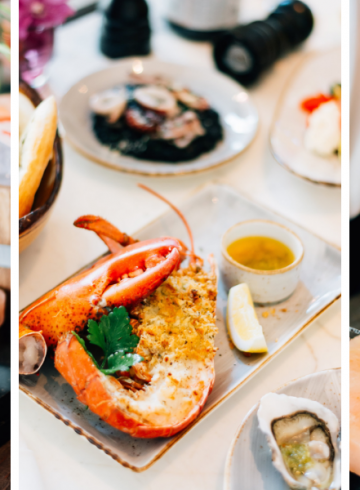 The brand’s ethos is to combine spectacular local experiences with the elegance and comfort synonymous with Sofitel’s namesake, promising nothing short of quality no matter what destination. 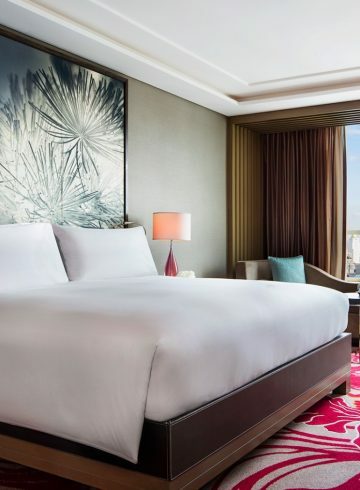 Located in the best area to stay in Bangkok for sightseeing, Sofitel Bangkok Sukhumvit stands tall in the city’s main culture and entertainment district. The property’s 345 exquisitely designed rooms and suites reflect Thailand’s vibrant and unique culture, while maintaining all the comforts of home, making the hotel an ideal choice for all types of travellers including solo explorers, couples, business groups and families. Our spacious accommodations are ideal for traveling with younger ones, promising all the comforts of home with the excitement of being abroad in the best family room Bangkok has to offer. As a top Bangkok bed and breakfast hotel, the property features an array of world-class amenities that include an outdoor swimming pool with stunning views of the city’s unrivaled skyline and the busy streets below. For guests looking to maintain their exercise regimes, the 24 hour fitness centre is equipped with a hydrobath and Minerale Spa Bar to indulge in after an extensive workout. The award-winning Le Spa with L’Occitane is a haven for wellness, offering a wide range of treatments that combine Ancient Thai healing methods with classic French philosophies and cosmetology. 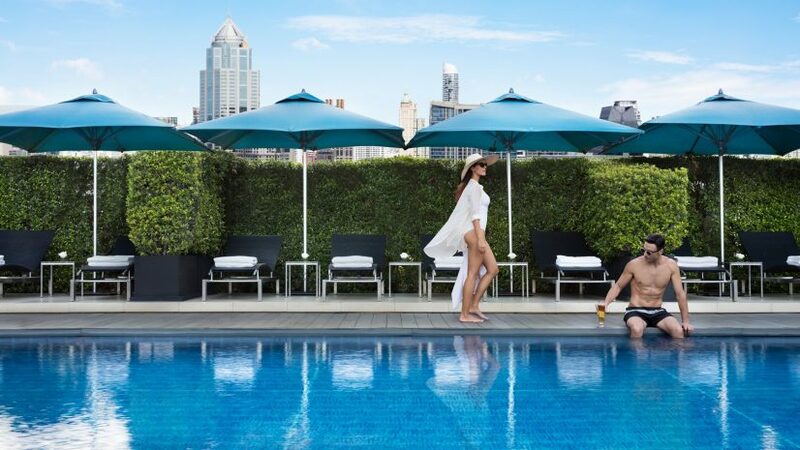 Sofitel Bangkok Sukhumvit truly takes pride in the diversity of our drinking and dining venues, including the breezy poolside bar for refreshments and snacks to soothe any hunger pangs while lounging in the sun. 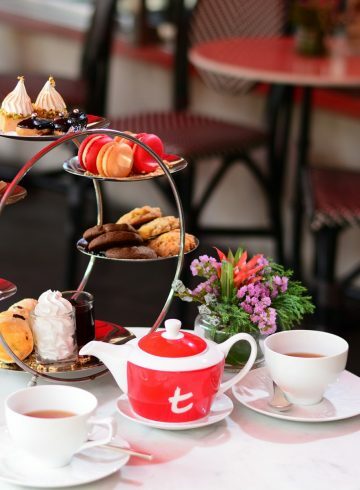 Le Macaron is perfect for afternoon tea and delights, whereas Le Bar de L’Hotel is an ideal venue for tasting delicious fine wines and sipping on unique cocktail concoctions in the comfort of our exuberant lobby. Moreover, all-day dining restaurant Voila! Is the perfect place to start your day, offering the best breakfast Bangkok hotel establishments can offer, dishing up both Asian favourites and Continental fare accompanied by exciting live cooking stations. So treat yourself to a rejuvenated morning at the best hotel breakfast buffet Bangkok is home to, before setting off on an adventure through the city’s exciting and diverse attractions. The property is conveniently located on Bangkok’s Sukhumvit Road or ‘Golden Mile’ which is a beacon for all types of travellers looking to enjoy the city’s wide-range of restaurants, bars, shopping outlets and cultural sights. The prime location also offers connectivity to the city’s efficient public transport network. The Asok BTS and Sukhumvit MRT stations are within walking distance, allowing for easy travel around Bangkok’s vast cosmopolitan area. These train lines also interlink with the Airport Rail Link offering stress-free travel to and from Suvarnabhumi Airport. As a reputable Bangkok bed and breakfast hotel located in the best area to stay in Bangkok for sightseeing, Sofitel Bangkok Sukhumvit is a top choice for any traveller. In addition to our ongoing special breakfast offers, guests who are a part of our Le Club Milliséme program will be treated to a variety of privileges including breakfast and refreshments in the tranquillity of our premium lounge, promising scrumptious bites to accompany a rejuvenated morning. So book now to secure a fantastic and delicious breakfast buffet to start your day off right every day. With competitive room rates and luxurious facilities, we guarantee that life will be Magnifique at Sofitel Bangkok Sukhumvit!